Instructions for the use of these databases (Graphic Interface). Subject Field: This contains a description of the principal elements found in the image. 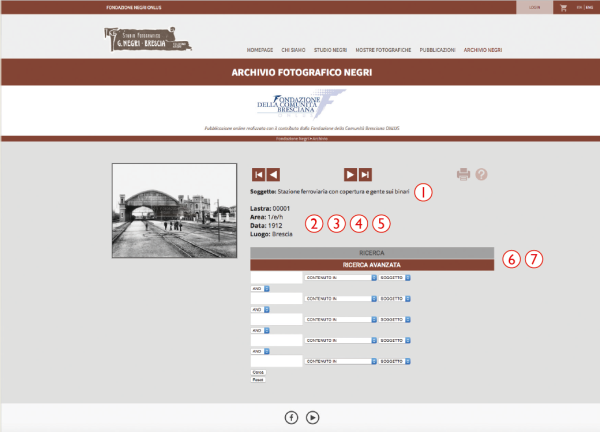 Glass Negative: This indicates the reference number given to each negative held in the archive. Date: The date normally refers to the day that the photograph was taken, but only if that information is known. Location: This indicates where the photograph was taken. Research: This key opens up the possibility of doing a simple research with the insertion of a single word. Advanced Research: This key opens a window of research which is able to apply terms from various different fields of activity. The dialogue space in this window can be used to insert the important words to help identify rapidly the areas under research. Examples of use appear below. Research subject 1 : Loggia Square at Brescia. Brescia: is the location named in the subject. Research subject 2 : Inside the O.M. factory. O.M. : The subject contains an exact description* of this name. 1/(q): The subject will be found in the (number + letter in brackets) classification code-list that follows on the next page. * “contains an exact description” This phrase means that the description is complete in itself. Without this phrase a computer might consider the letters “om” to be part of another word, such as “complete”. (a) Natural and atmospheric phenomena. (b) Natural disasters, hydro, geological and extreme weather effects. (e) Minerals, Microphotography, Medical photography. (n) Civil and military engineering projects. (o) Work-sites, mines, earth-moving projects. (y) Archaeology and historic architecture. (z) Aerial and submarine photography. (b) Pastoral and animal breeding. (g) Domestic and female occupations. (j) Harvesting, hunting and fishing. (k) Artistic and theatrical occupations. (l) Liberal professions and scientific research. (c) Maritime or fluvial transport. (b) Public and private armed forces. (c) Public and voluntary social work. (e) Medical and psychological care centres. (a) Images of local costumes. (g) Leisure and holiday activities. (a) Household objects or tools. (b) Symbolic, religious or magic objects. (e) Kitchen activities and gastronomy.